Get a bonus free gift when you checkout with Paypal! For all orders paid with Paypal from our website, get a free set of Milspex 3M EMG (Enhanced Magazine Grip) for free. This grip tape was inspired by Magpul Training Professionals who found that 3M tape on magazines allowed for better grip and faster magazine changes. Later, it was found that these grip tape could be applied to various parts of your weapon for better grip overall – including on slides, pistol grips, and more. 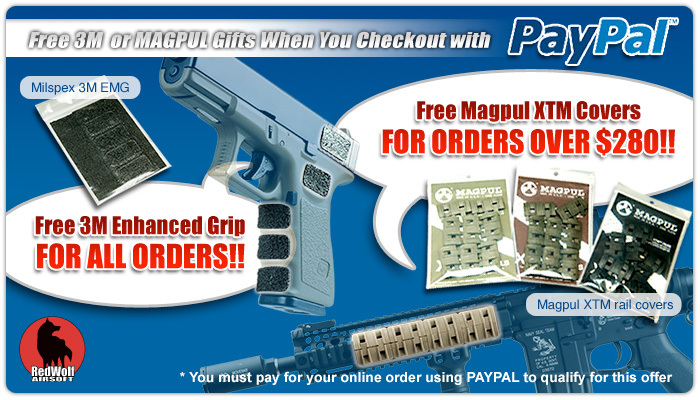 Purchase over $280 on our webstore and checkout with Paypal to get a FREE set of Magpul XTM rail covers. These tactical covers are hot right now and everyone is fighting to dress up their rails with these innovative covers.